(Nanowerk News) Tiny chemical cages created by researchers at Rutgers, The State University of New Jersey, show potential for delivering drugs to organs or tissues where they're needed without causing harm elsewhere. These cage-like molecules, called nanocontainers or nanoscale capsules because they measure a mere 3.2 nanometers wide, also could make pesticides less hazardous to handle, filter toxic substances out of wastewater and regulate the pace of reactions in chemical production. "While the concept of chemical cages is not new, we've created new components and advanced the assembly process to increase the chance that they'll become practical," said Ralf Warmuth, associate professor of chemistry and chemical biology at Rutgers and lead researcher. "We've shown a way to securely link molecules together in a cage using an efficient, one-step process." In an article published in the Dec. 30, 2005 issue of the chemistry journal "Angewandte Chemie International Edition", Warmuth and colleagues describe how they've used common organic chemicals and straightforward techniques to create nanocontainers. These octahedral (eight-sided) capsules, with their cavity volume of almost two cubic nanometers, could enclose one or more molecules of a medicine, pesticide or intermediate in a chemical manufacturing process that, if left uncaged, might prematurely decay or interact with other substances in passing. Previous techniques for assembling molecular cages involved tradeoffs. 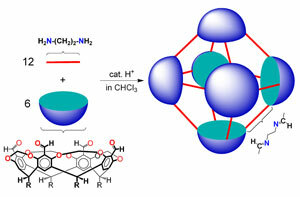 With one approach, the synthesis technique was straightforward, but the pieces of the molecular cages were not bound as tightly to each other. Another approach resulted in tighter bonds, but the process required several carefully orchestrated steps. The Rutgers advance is a one-step process that creates tight chemical bonds, surpassing earlier approaches in simplicity and efficiency. The Rutgers process involves combining six larger bowl-shaped molecules with 12 smaller linear molecules, or bridges, that link the bowls together, insides facing each other. Atoms at four sites along each bowl's rim bond to atoms on the ends of the bridges. The atomic structure and properties of these molecules ensure that they naturally assemble themselves into capsules and do so with high yield when combined in proper proportions. Early research suggests that the connections between the bridges and bowls can be broken and reattached under controlled conditions to introduce "payload" molecules – such as a drug or pesticide – into the cage and extract them when needed. The Rutgers team consisted of Warmuth, chemistry graduate students Xuejun Liu and Yong Liu, and undergraduate student Gina Li. The work was funded by grants from the National Science Foundation.